The Snetind was originally constructed by J.H. Price Shipbuilding Company in Seattle, Washington in 1919. 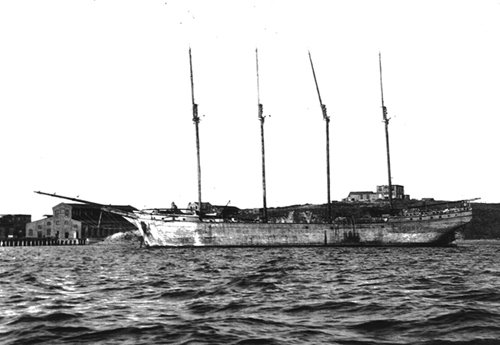 The 1500 gross ton freight schooner was owned by Joseph Gorman of Worcester, MA and operated out Boston until the late 1920s. But perhaps more interesting than her life as a twenties-era freight hauler, is the story of a family of squatters who called the ship home. While berthed at a Federal wharf in Boston, no longer in use, the Snetind was purchased by Mrs. Ann Winsor Sherwin, a divorcee who had withdrawn from fashionable society. She became a squatter, living in an abandoned millhouse with her three children on Long Island before acquiring the ship. A woman of good family, she lived aboard the Snetind, operating an arts and crafts store for several years. In 1936, a successful court order resulted in the removal of the vessel from the wharf and it’s placement on a mooring off Castle Island. There were also unsuccessful attempts to evict Mrs. Sherwin and her son from the ship, but Mrs. Sherwin persisted in living onboard the schooner. A 1936 winter gale tore the Snetind from her mooring and wrecked her upon Spectacle Island. Mrs. Sherwin and her son continued to live aboard the vessel, even while wrecked and abandoned on the island until the 1940s. When her son was drafted and went off to war, Mrs. Sherwin was forced ashore, suffering from illness. In the early 1950s, at about age 80, she was last reported to have been living in Virginia. The Snetind caught fire in 1947 and burned on Spectacle Island. With fire extinguished, the blackened schooner was ordered wrecked and sunk off Boston. The vessel was towed out and sunk amidst crowds lining the beaches as she passed by. The lonely ghost ship sank with a only patch of flowers on her blackened deck into 190 feet of water on July 21, 1951. The wreck was located and researched in the mid-1990s by Eric Takakjian. Today, the Snetind, known among local divers as the “Schooner Barge”, can be found upright and largely intact. The decks have collapsed in most areas, but the hull structure remains solid. The bow of the wreck has begun to collapse as well. The top of the wreck can be reached in about 170 fsw, with max depths to approximately 190 fsw. The wreck is large, but relatively straightforward to navigate. Like many vessels heavily fished, this wreck has its fair share of nets and entanglements. It certainly is one of the more breath-taking wrecks on a day with good visibility.